The idea has already been tossed around for twenty years – now it is finally being realized: The development of a market-ready fuel cell bike. As gas specialist Linde announced in November 2015, it took in-house engineers less than three months to design an electric-assisted pedal cycle equipped with a fuel cell instead of a battery pack. The required hydrogen is brought along in a composite tank, which can hold 34 grams of the gas at 340 bar. The energy stored in it is enough to power the bike for around 100 kilometers. 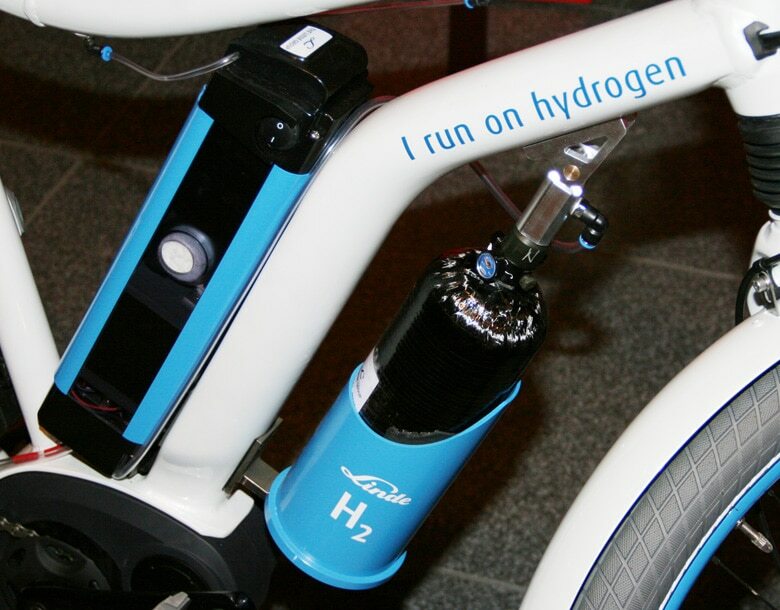 The intermittent storage of the Linde H2 bike consists of a 60-Wh battery. Pragma Industries, on the other hand, does take the commercial route. In May 2013, the company presented its Alter Bike. Back then it was said that Pragma’s H2 bike would be available to customers from 2016 on. And, in fact, the French business announced in the fall of 2015 that it would enter the market with the new Alpha model, priced at EUR 2,300. It is said to match the Linde bike’s 100 kilometer range, but is equipped with a bigger battery (150 watt-hours). The initial production target is also 100 units, according to Pragma CEO Pierre Forte. In 2017, however, it could already be 1,000.